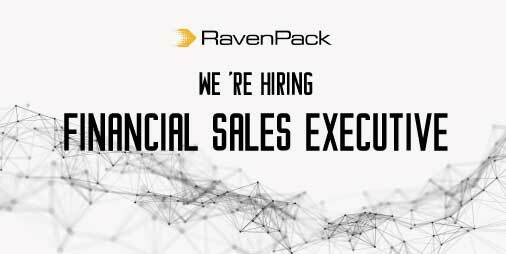 At RavenPack, we are searching for a Financial Sales Executive to join our Sales & Marketing Team. As a Financial Sales Executive, you will be in charge of developing relationships and closing contractual commitments to subscribe to the firms' financial data products. You will be reporting directly to the Director of Sales & Marketing and will interact with our Client Support, Data Science and Product teams to achieve your goals. We provide an attractive compensation plan which is commensurate with experience. You will be responsible for managing the sales process for new business within the USA. You will be developing business strategies and sales tactics to prospect and close new strategic clients, to ensure territory growth and profitability. You will also work closely with the Account Management team to identify and close additional sales opportunities with existing customers when needed. Develop knowledge and a thorough understanding of the firm's products and the business problems they can address in the financial marketplace. Uncover new revenue opportunities within an account based on the understanding of the workflows and quantitative strategies being deployed within the prospect. Pricing and conducting the negotiation with customers. +3 years of experience in a comparable financial sales environment, preferably financial software or data products with an emphasis on trading, risk and asset management. Bachelor's degree – preferably with a focus on business and finance, computer science, or mathematics. Strong communication skills, both oral and written. Ability to convey important messages to clients and develop a rapport over the phone. Excellent time management/organizational skills. Able to multi-task and adhere to short deadlines. If you want to make a difference by participating in meaningful projects and working with the most innovative company in the financial technology space, RavenPack is the place for you. RavenPack has an amazing team and we are proud to provide a supportive environment where everybody can enjoy the continuous learning curve. Meaningful work: RavenPack solves real problems by developing unique technologies. Team of excellence: We are proud to gather an international and diverse team of talented professionals that decided to join us to make a great impact in the world. Competitive Salary: In RavenPack, we believe that your time and experience needs to be fairly rewarded. Continuous learning: Never stop learning! We offer the support that you need to grow within the team. Innovation: Innovation is the key to our success, so we encourage you to speak up and tell us about your vision. Supportive environment: We believe in finding a balance between private and professional life, so we are open to hearing your personal circumstances to ease the adaptation. Professional growth: Once we bet on somebody, we want you to be part of the family and to grow professionally with us. Flexible Holidays: You will enjoy paid holidays plus bank holidays and we give you the flexibility on when to take them. For example, you can choose to work on a bank holiday and swap it for another day of your choice, so you can take a better advantage of your time off.